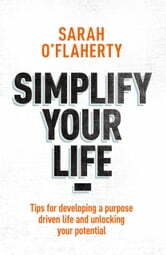 Simplify Your Life | Rakuten Kobo. Do you wish life was a little easier? Discover the secrets to a simpler, more satisfying life. Is your life lacking purpose? Are you often stressed and overwhelmed? If so, then it's time for a crash course in the skills that will lead to a more meaningful life. Let successful businesswoman, coach, and author Sarah O'Flaherty be your guide. Developed from the integration of hundreds of books, a multitude of personal development training formats, and a twenty-year career motivating people, Sarah has created a simple, yet effective, four-part process that will provide you with the skills and confidence you'll need for a happier life. Each section is presented in a simple style, with tips and easy-to-adopt strategies that will teach you how to unlock your potential. And the best part is, you'll enjoy reading it! * How to identify your values, strengths, and passions for greater self-awareness and increased life satisfaction. * How to develop strong healthy relationships so you can benefit from your interactions. * How to find your purpose or calling for a more meaningful life. * How to un-complicate your life with some essential tools such as mindfulness. Simplify Your Life is packed with straightforward, honest, and practical advice. If you enjoy easy reads that really add value to your life, then you'll love this book. Sarah takes you straight to the foundational aspects of life that, if you get right, will ensure a satisfying and meaningful life. Unlock your true potential with Sarah's easy-to-follow guide today! Develop Powerful Self-Discipline and Self-Motivation - Go From Wishful Thinking to Action and Total Success! It's Now or Never: Simple Effective Tips to Overcome Procrastination, Achieve Any Goal and Enjoy Your Life! Instant Habits: How to Break Bad Habits and Form Good Habits Instantly! Instant Energy: How to Get More Energy Instantly! Bubble Riding: A Relaxation Story, Designed to Help Children Increase Creativity While Lowering Stress and Anxiety Levels.